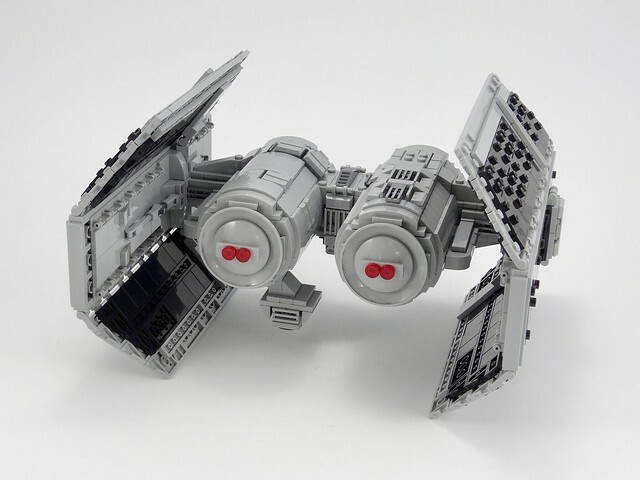 The Imperial TIE Bomber doesn’t get a whole lot of screen time in the Star Wars films, but its unique twin-fuselage design has made it a fan favorite over the years. Polish builder barneius uses the new TIE fighter canopy, placing his model in the same scale as official LEGO sets like 75211 Imperial TIE Fighter. The ordnance pod with its forward missile port is wonderfully detailed, as seen in the photo above. This next rear view showcases the excellent shaping of the fuselages, along with the bomb chute that extends down from the ordnance pod.